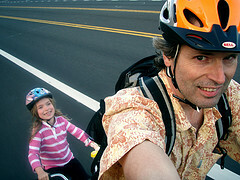 Just the other day, my youngest daughter and I rode our bikes down to a nearby park. Spring has definitely sprung here in our part of the midwest, and we both wanted to get out and enjoy a warm, sunny evening after a particularly brutal winter. 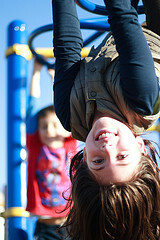 My daughter acts like your typical 8-year-old kid at the park. She loves to ride her bike, swing, climb the rock wall, and play on the jungle gym. I get a kick out of seeing her have a fun time, and this trip to the park seemed like an ordinary one, that is until... God showed up. Okay, well, He didn't exactly show up in a literal sense, but as I was playing with my daughter, I was reminded several times of the unique similarities there are between my relationship as a father to my daughter and God the Father's relationship to me as His child. So jump on your bike, follow me down to the park, and I'll fill you on what I learned about God as well as myself on the journey. When I ride bikes with my daughters, I can choose three ways to ride with them, depending on the circumstances of our trip. One, I can let them lead, and I simply follow behind. This is the best way for me to keep an eye on them at all times. Two, I can ride beside them, if there is, of course, enough room on the sidewalk or street to do so. And three, I can ride ahead of them. When I'm out front, I can lead my daughters and they can follow from behind. You know at various times, I think God handles His children the same way that I ride bikes with my girls. Sometimes, He constantly watches us from behind to make sure we don't fall down and that no one can sneak up from behind and hurt us. Other times, He may come alongside us because He wants closer contact with us. And finally, He may lead from the front because we need His guidance on where to go and what to do. "Daddy, push me! I want a Superman push!" 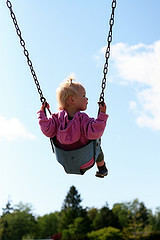 Every time we go to the park, swinging on the swing set is one of my girls' favorite things to do. In order to do the Superman push to their satisfaction, I have to get behind them on the swing, push as hard as I can to get them high enough in order for me to run directly underneath them and get to the other side without getting whacked in the head by their feet. My girls love it because with a bunch of help from me, they don't need to work very hard to get going as high and as fast as possible in a short amount of time. I think we probably do this with God the Father at times as well. God, I need your help to get me going here. Things are moving too slow for my satisfaction. I need You to give me a "Superman push" so that I can fly high and fast, because I can't do it in my own strength. There are going to be times when He will give us that big push we need to get moving. At other times, I'm sure He will allow us to figure out how to climb and fly on our own because He has lessons to teach us on our spiritual journey. 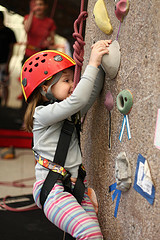 For a little kid, the rock wall can be a scary place. The little "rock anchors," you know those little foot and hand holds, can seem not very stable for little hands and feet. Then, if you get up too high on the rock wall, the little wall climbers get afraid that they are going to fall off and hit the ground! When my daughter and I were at the park, she started climbing part way up the wall, and then immediately called me over to assist her. She was shaky, uncertain, and afraid. "Daddy, I'm not sure how to do this..." was her response as I walked up behind her. "Honey, here's how you do it..." was my answer, and I proceeded to physically show her where to place her hands and feet on the appropriate foot and hand holds in order to pull herself up the wall. With a little guidance from me, she did it, and boy was she proud of herself for making it up to the top! Then came the tricky part - getting back down off the wall! Again, I gave her some guidance on where to put her hands and feet and she slowly proceeded to climb back down. She needed reassurance from me, though, that I was right behind her the entire time in order to catch her if she slipped. In our journey through life, we're going to come right up to some difficult mountains to climb. We can't figure out how to get up and over the stupid thing. 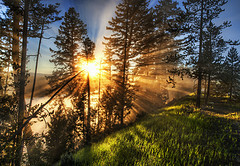 We need a lot of help, so we call on our Heavenly Father to assist us, and He guides us on the path to take. We are able to accomplish what in our mind is an impossible feat with His help, and we are reassured that He will catch us if we slip and fall. The final part of playing at the park for my daughter came at the jungle gym. "Daddy, look at me; look at what I can do!" This is when I can just be an observer and see what she can do. She seems totally fearless as she flips around a hanging bar, or uses her hands and arms to swing across a set of monkey bars. She is in her element. She has done this enough times to be totally secure in her play. I believe the same is true in the ways God has gifted each and every one of us. When we are working in our strengths, doing what God has called us to do, then we are fearless. We are having a blast. We are showing the Father what we can do with what He has blessed us with. Eric Liddell, the missionary who was also an olympic runner said it best (at least in a line in the movie Chariots of Fire), "God made me fast. And when I run, I feel His pleasure."